Here is a picture of the church from the inside. It's enclosed other than the windows and doors. Brent and Bekah give a little perspective. 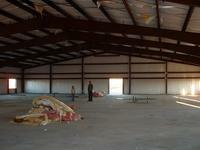 I'm standing on the sanctuary floor looking toward the fellowship hall.